A zoo in Tehran killed 14 lions after they were infected with a bacterial disease called glanders. Glanders is an infectious bacterial disease that is normally contracted by domesticated animals like horses, donkeys, and mules. Wild animals, however, can be affected as well. The disease can also spread to humans. 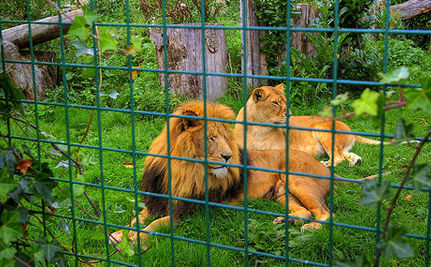 A veterinarian named Houman Maloukpour told Iranian newspapers that the lions most likely contracted the disease through mismanagement by zoo officials. He also stated that the lions didn’t need to be killed, since glanders is treatable in wild animals, even though it is usually untreatable in domesticated ones. In addition, Maloukpour says that three other lions have died of glanders at the zoo, and one tiger also died two weeks ago in what the zoo claims was an unrelated incident that may have been another glanders death. Glanders is a disease that is infectious and highly deadly. It was deliberately spread by Germans and Japanese during WWII as a biological weapon. Animals can contract it through contaminated food and water and humans can then contract it through contact with infected animals. Glanders has been eliminated in North America, Australia, and most of Europe, but it is still endemic in much of the rest of the world. There are fears that feral cats that roam the city may carry the disease from the zoo out into the densely-populated neighborhoods nearby. It’s not hard to see a disturbing chain of events here. According to experts, the zoo mismanaged the care of its captive animals and exposed them to a deadly disease and had the animals killed instead of treating them – presumably because it was easier or cheaper than treating them or because officials didn’t even know they could be treated – all the while potentially exposing humans to a pathogen that can kill in mere days. Why are zoos immoral? Why should we boycott them and all other forms of animal exploitation, consumption, and entertainment? Because of situations like this where beautiful intelligent animals are held captive for the amusement of humans, they are infected with diseases under the negligent care of zoo employees who are somewhere between incompetent and malevolent and are then killed so they don’t pose more of a risk than they already do to nearby humans. When animals are held captive for human amusement, there can be no positive outcome. Lions do not exist for our entertainment any more than cows exist for our consumption. And as long as we treat animals like inanimate objects to be bred, used, and killed flippantly, then situations like this will always be the rule and not the exception. This zoo should not be operating if they don't know how to manage diseases or health problems in the animals for which they are SUPPOSED to be the caretakers...! I will never go to a zoo again for the rest of my life. wild animals belong in the wild !!! Shame on them for killing these animals instead of treating them!